With Spring around the corner I’m all “goodbye oatmeal, hello fresh flowers and brunch perfect recipes”! And that, my loves, is why my sister and I plated up blueberry blintzes for breakfast yesterday. Hannah is visiting from Texas this week and crepes/blintzes are her specialty. They’re a little time consuming, but totally worth it. Blintzes taste just as beautiful as they look. Cross my heart. And yes, the gorgeous table runner from Minted was icing on the cake when it came to our tablescape. Honestly, I had kind of put Minted in a box with their paper products. So silly of me. Of course it only makes sense that they would transfer their gorgeous designs to other textiles. Oh yes, Minted pretties are also found in wall art, fabric, lampshades, curtains, pillows, AND table linens. When the folks at Minted shared their new line of linens with me I squealed with delight. How perfect are these for Spring, even more, Easter!?! I chose Floral Chalkboard in Bluebell and the perfect details of this print make me smile every time I glance at our table. Spring is around the corner, mamas, Sunday in fact, and Minted is ready to brighten up your dining space! Tell me, what placemats, napkins, and table runners do you want alongside your blueberry blintzes and other brunch favorites? 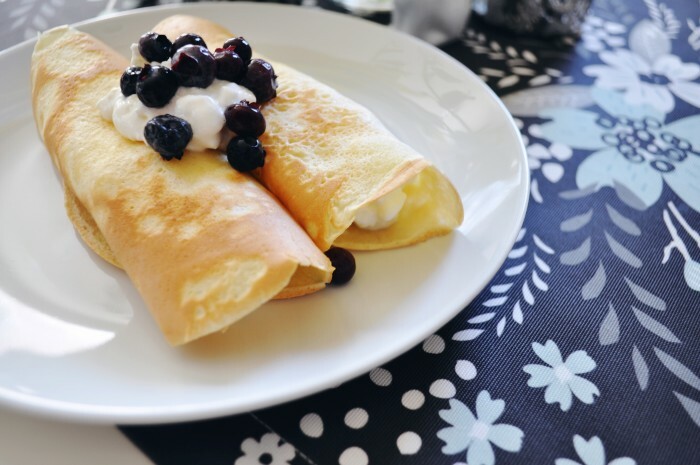 Enjoy our family favorite recipe for blueberry blintzes and don’t be afraid to mix up the filling with lemon curd, strawberries, or a drizzle of syrup. Use a whisk to blend all crepe ingredients into a smooth, thin batter. Combine filling ingredients in a medium bowl and set aside. Preheat a 10" frying pan over medium heat. Melt 1/2 teaspoon of butter in the pan so the batter won't stick. Pour 1/3 cup of batter into the pan and swirl until the bottom of the pan is fully coated. Cook for 1-2 minutes or until golden brown on one side. Use a spatula to lift the edge and with your fingertips and the spatula carefully flip until the opposite side browns. Repeat with the remaining batter. Lay the crepe on a plate and spoon 3-4 tablespoons of filling down the center, gently roll. Top with a dollop of filling and extra berries. Table linens c/o Minted. Shop all their gorgeous designs here.